Print the flyers and share at work! Plan a meeting or get-together and help support the band! Look for the Facebook or Twitter ad shortly and share share to you page and invite your friends! The flyer will also be available Wednesday in the District new e-flyer system – PeachJar. As director of the BPYO, I’d like to extend an invitation to musicians in your program who are interested in an orchestral experience. My immediate openings are for two clarinets, french horns, percussion and a trumpet. I’d consider any interested players, of course! BPYO meets Mondays 6-8 at Garfield MS in Hamilton, Dec. 10 concert- Mozart’s Abduction from the Seraglio Overture, Canadian Brass Christmas, Bernstein’s West Side Story Overture. The Lakota West Swing Dance 2018 is just 5 weeks away – Friday December 7th from 7:30- 10PM. The event is open to our entire community! Bring your friends and family of all ages for an evening of live jazz performances from our outstanding musicians, delicious snacks and desserts, and dancing. There will be swing dance instruction and a Dance-Off. To make this a special night we also need volunteers. Jazz parents are requested to take a shift to set up/decorate, sell tickets, run coat check, serve snacks, and/or tear down/clean up. Most shifts are 1-2 hours so there is plenty of time to enjoy the entertainment before or after your shift. You will not miss your child playing. Whether your child is in jazz or not, please consider taking a shift at this fabulous event! Sign up is here. Marching Band and Colorguard uniform Turn In Night is immediately following the Final Concert on Thursday, November 8 in the West Band Room. ALL parkas, shakos, shako boxes, gauntlets, umbrella props, color guard uniforms (and garment bag) MUST be turned in WITHOUT exception on or by this date. If you will not be at the Final Concert, bring all turn in items to the West Band Room Uniform Closet BEFORE Nov. 8, or make arrangements with a friend who can bring them for you on Nov. 8. A list of missing uniforms will be provided to the directors on Friday 11/9. Seniors—We will be accepting donations of your gently used Summer Uniform Red Polo and Black Shorts if you’d like to hand them down for future band members! We need volunteers to help so we can get everyone through quickly! Signup is here. QUESTIONS? Contact Amy Koenes at 513-593-4365 or uniforms@lakotawestbands.org. Please make your final payments for the Indianapolis trip via EZPAY as soon as possible. Thank you. Our Superintendent accepted our request to have an upcoming Community Conversation about Band/Instrumental Music at Lakota. East staff and families will be joining us. The date will be an evening in January and we will publish it as soon as it is confirmed. We hope to have parents AND students participate and share your thoughts about the current state of programming and support, and what we would like to see in the near future in order to protect and grow our music program. If you have any questions or comments, please email communications@lakotawestbands.org. Information about Lakota District Community Conversations can be found at this link here. 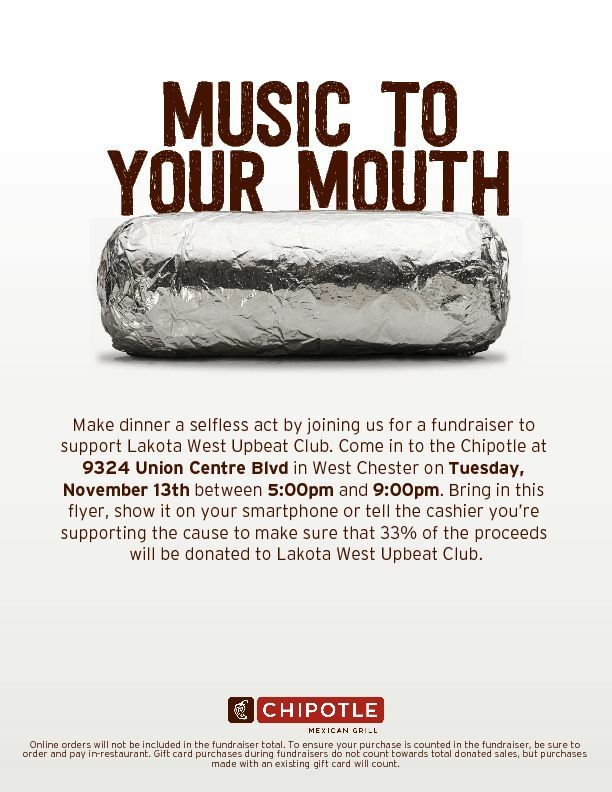 Lakota West Band Business Boosters (LWBBB) was formed as a way for band parents who are also local business owners to support and promote the band. The LWBBB holds monthly breakfast meetings at 8 am at the First Watch Union Centre Boulevard location on the morning of our Upbeat Club meetings (3rd Thursday of the month). For more information, contact Kevin Moorman at 604-2997. All parents and guardians of band students grades 7-12 are welcome to attend! Meeting will start at 6:30pm at the MAIN CAMPUS Building in the band room. Note move to main campus for remainder of year. If you have questions for the Board or need to meet with them, they will be available at 6pm. Come out to see what is ahead and get your questions answered. For all Upbeat minutes, financial reports, budget and more, please go to our Upbeat web page here. Note, December Upbeat meeting moved to Thursday Dec 13 due to winter break.